Coming into the season, RG was one of the biggest question marks. Some suggested we sign Carl Nicks. Others suggested we draft Kevin Zeitler, Amini Silatolu, and even trade up for David DeCastro as he slipped. In house upgrades? It was Daniel Kilgore who we thought would win the job...some even thought we should slide Anthony Davis to RG and insert Boone at OT. Instead, we switched Boone from OT to OG. Height be damned, i don't think its a stretch to say that Boone is currently playing like the best OG in football. He's dominating in the run and pass game. His presence is a direct benefit to Anthony Davis. And he can play OT too! He shut down the Giants pass rushers as both a RG and LT! He's effective and versatile. The best part...he's locked in for about 3 more years, and is only 25 years old! Here's to Boone for not only answering a huge offseason question mark, but turning it into the strength of our team. Boone has been amazing. Davis stepped up big time too. I'm glad he proved me wrong, because I was one who campaigned for sliding him at RG (where I thought he'd be an instant probowler anyway). Davis really stepped up and become a great player in his own right, and Boone came in and did it as well. Great post, 49ersfan. 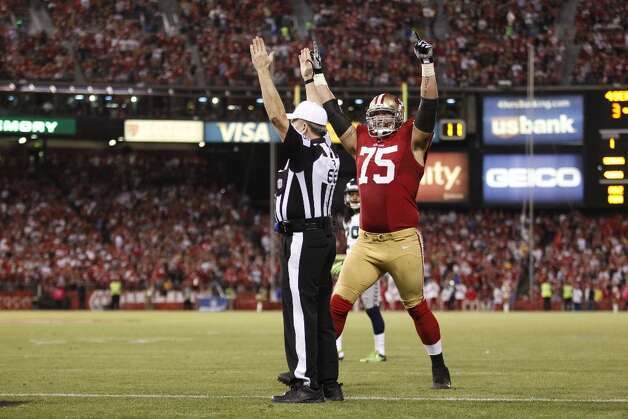 Boone really has solidified our OL, and has quickly become a favorite 49er of mine. I too questioned the move, but now love it. Boone has been great, but I've been more surprised by Goodwin's play. I'd have to guess that they are not mutually exclusive events. Goodwin was an All Pro in New Orleans when he had Nicks and Evans on his sides. Last year with Snyder to his right, he was not impressive to say the least but with Boone and Iupati, back to great form. Got to give Sing some credit despite his abominable coaching skills. Sure helped out this kid (and VD as well). Boone would undergo treatment for alcohol abuse and arrive three months later at the 49ers' post-draft minicamp as a noted "character risk." Then-coach Mike Singletary did not wait long to tell Boone what he expected. Singletary promised Boone, "I'm going to break you like a wild horse."